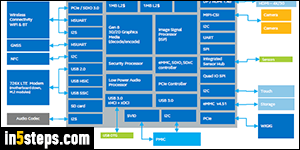 Since Windows XP (first 64-bit version of Windows offered), 64-bit architecture has become increasingly common, especially since 64-bit version of Windows are backward-compatible with 32-bit software. That's why, in doubt, it's always better to install the 32-bit version of a program - unless you are running a 16-bit version of Windows (older than Windows 95! ), it's pretty much guaranteed to run. In the "Where are programs installed?" tutorial, I showed you how Windows stores applications differently depending on their architecture. 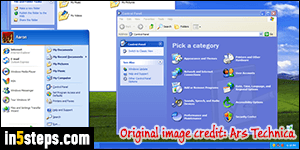 In Windows 7, open the start menu and type "system": click on the System link result under Control Panel. In Windows 8, type "system" on the start screen and click on the PC Info result. 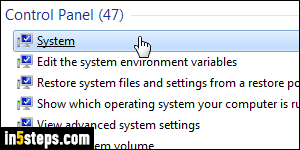 In Windows 10, type "system" in the start menu's search field, and click on the "Control Panel - System" result. In all three cases, the Control Panel will open, showing you the same screen. That information is in the middle of that screen: it shows your processor (CPU) name and clock speed, your installed memory (RAM), and your architecture on the right of "System type": 64-bit Operating System means that you are running a 64-bit version of Windows, regardless of version or edition (Home / Premium, Pro / Professional, etc.) Otherwise, it will say 32-bit. You can type "winver" -short for "Windows version"- in the start menu or start screen, but that only gives you the version and edition, not the architecture unfortunately. Whatever architecture you have is there to stay: you can upgrade between default versions of Windows, as long as they're both 32-bit or 64-bit. To install a 64-bit version of Windows when you are running a 32-bit version, you'll need to perform a clean install (and make sure that your processor supports 64-bit). It isn't an upgrade: it's like a fresh start where you lose all your settings and files. So backup EVERYTHING safely before you get started with your upgrade! 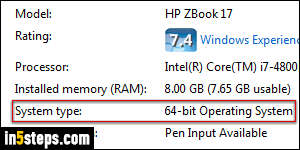 What are the advantages of 64-bit? Mostly, performance, across the board. Secondly, RAM support: a 32-bit edition of Windows 7 supports up to 4 gigabytes (GB) or memory - not all of which will be usable, whereas a 64-bit flavor of that same edition supports anywhere between 8gb (starter edition) to 192gb (!) for Professional to Ultimate editions. And opting for a 64-bit operating system, if you can, makes your computer much more "future proof".